Black Ink: My New Cover! 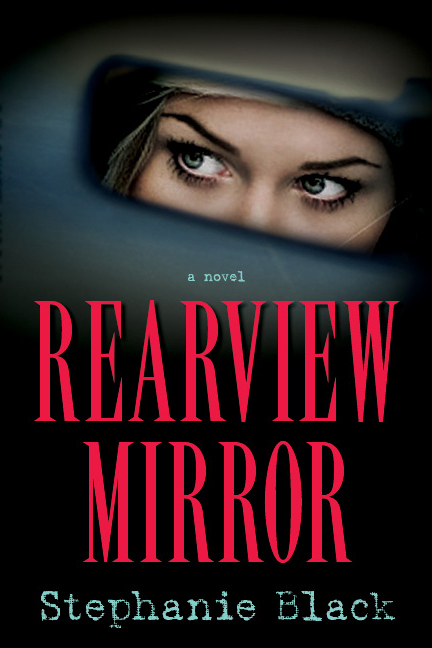 I am thrilled to introduce the cover to my upcoming novel, Rearview Mirror. Didn't the designer do an awesome job? The book will be released in October. Sorry for the lack of blogs lately. Summer has been crazy--we were on vacation, then returned with only three weeks left until Girls Camp (I'm the Stake Camp Director--ack! ), so we have the final camp Prep and Panic to do, and in the midst of that, the edit for Rearview Mirror arrived in my inbox. Life is NOT boring! But I turned in the edit this morning--yay!--and we've got a week and a half remaining until Girls Camp, and things should work out provided I never answer my phone again, because answering the phone in the weeks before camp is just asking for trouble. I'll resurface again when camp is over and hope to report that NO ONE GOT A STOMACH BUG. Unlike last year . . .
Yay for no stomach bugs! I like it! Congrats on the new cover! Great cover! I can't wait to read the book. Stephanie, I love this!!!! I think it's my favorite covers of yours. Very cool! Great cover! A number of people have asked when your next book is coming out. Now I can telll them and direct them to your blog to see the cover. Very interesting cover! Love it. I love the cover! I can't wait to read it. Glad you're back! =) Good luck with Girls Camp! Walk softly and carry a big shoe. The woman in the mirror looks terrified enough to be going to girl's camp. Wait--it's not you, is it??? Love the cover. It's got "suspense" written all over it. Thank you so much for all the kind comments! I'm excited about the cover. Jon, sorry . . . I'm just not sure your subtitle would go along with the suspense feel . . .
Gregg, HAHA, yes, that's exactly how my eyes look in the weeks before camp. Donna, I'm so excited that your friends are enjoying Cold as Ice! Thanks! That looks great and I can't wait to read it! good luck with everything.